Inspired by Dynamic Earth’s latest posts on modern/Recent sedimentation in Death Valley (see here and here), I decided to post one of my own photos from Death Valley for this week’s Friday Field Foto. I forgot exactly where this location is (I’ll have to look at my notes), but it’s representative of the kinds of modern deposits you’ll find in the fans in the Death Valley/Owens Valley region. Similar to the last photo in this post, deposits from the most recent events stand out nicely as a function of color (the light gray). What I like about this particular deposit is that you can pick out the levees in the upper right part of the photo. In these types of flows, the chunky stuff (i.e., coarser-grained material) get pushed to the front and the sides of the flow. As the flow moves down slope, levees of coarser material develop. 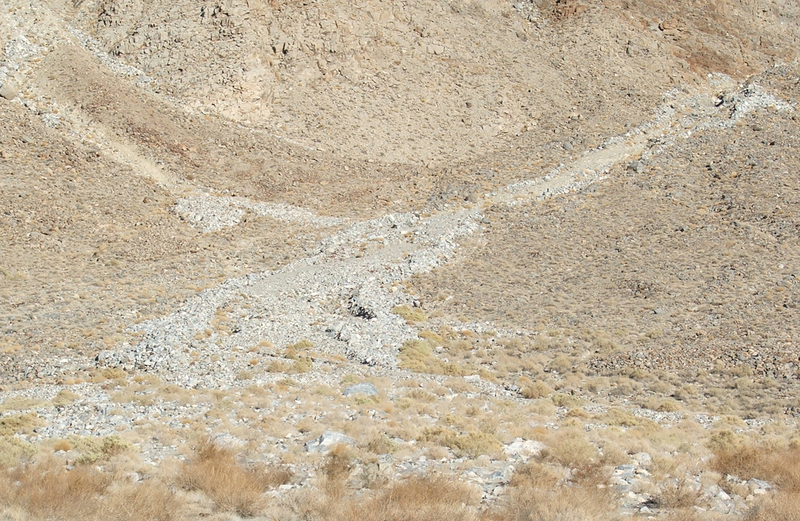 Next time you are in Death Valley, go walk around on almost any alluvial fan and you should find this (some better developed than others). Now move down slope from the leveed area … note how the distribution of the lighter material is starting to spread out a bit. Finally, at the terminus of the deposit, you’ll see some very nice debris lobes. One of the coolest aspects of visiting these features on field trips is that you can see the products of a single event (or series of multiple events closely related) in a relatively small area. ← Coming soon … Google Ocean!